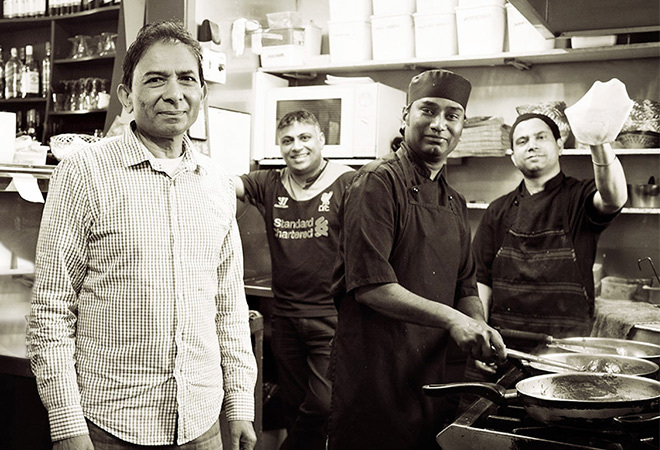 Way back in 1997 the owners, Govind and Hasu Patel established Planet Spice with the aim of spicing up the local food scene by giving Newtown its first Indian restaurant. You will find our approach to food is definitely not your typical Indian restaurant’s. We aim to please all palates, from your classic curries like “Butter Chicken” and ”Rogan Josh” to our changing specials such as “Kerala Duck” and “Tandoori Green Chilli Chicken”, there is something to please everyone. Our skilled chefs from India combine fresh produce and home ground spices to create a unique and authentic dining experience. Each of the meals from our kitchen is cooked to order and demonstrates our love and respect for Indian food and culture. So come on down to Newtown and try it for yourself. You will find that the relaxed and vibrant atmosphere combined with our friendly and knowledgeable staff will make your visit memorable any day of the week. We are open for dining during standard lunch and dinner hours and we also cater for those who prefer to enjoy our food in the comfort of their own homes. To this day we are still a family run business, feeding more than just the Newtown locals. In fact in the 2012 “Capital Times” best of poll we were voted as one of the top two Indian restaurants in Wellington! Husband and wife duo, Govind and Hasu Patel already had a flair for business and when they were introduced to the world of hospitality they discovered their passion for food. In the same place where Planet Spice is today they established their own takeaway and after a few months they found that Hasu’s Indian cooking was the most popular item on the menu. Her style of home cooked curries was in so much demand that in 1997 they made the decision to turn their business into an Indian restaurant and Planet Spice was born. A traditional clay tandoori oven and professional chefs were brought in from India and the recipes were passed on to them. To this day many of those original recipes are still used.